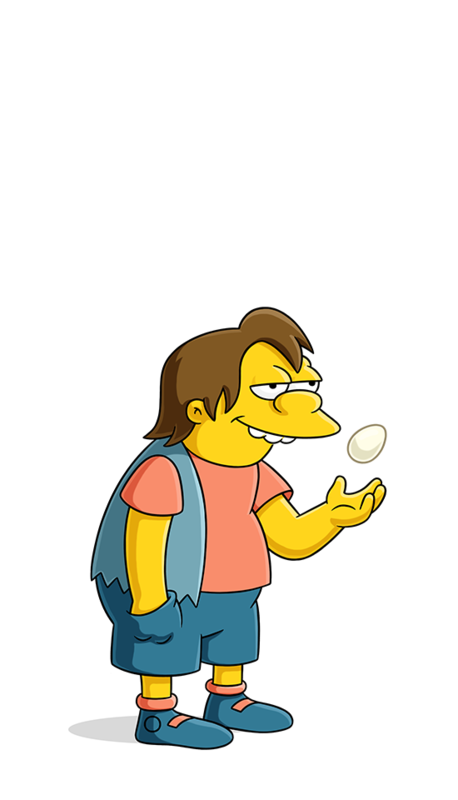 Nelson Muntz /Springfield School bully. Merciless in relieving bart of lunch money and family jewels. Specializes in wedgies, slime wedgies, and the dreaded Rear Admiral. Likes brass knuckles. Says: "Haw Haw!" in high pitched sarcastic tone. Bart tries to defend Lisa from a bully and gets bullied by Nelson Muntz. A tall man that Nelson laughs at turns the tables on him. Nelson confronts Bart for ditching him to go play with Milhouse. Milhouse has no fear of Nelson beating him up. Bart has to take medicine. Okay... But if anybody sees us, I'm just there to steal your bike. So moody! Just like my mom on her Can't Dance days.